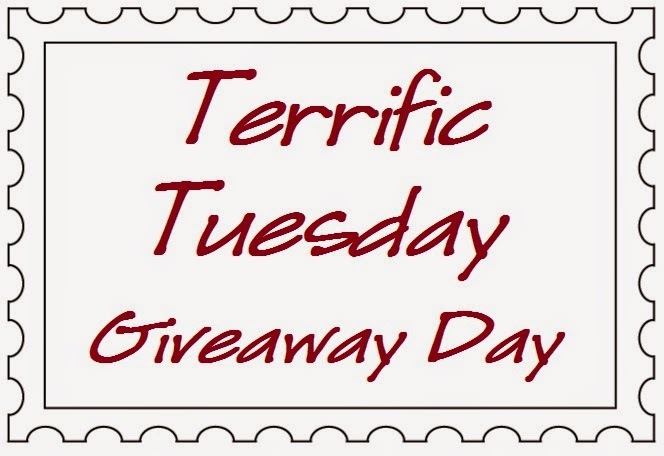 Happy Quilting: Terrific Tuesday Giveaway - Welcome Kimberly's Fabric Stash!!!! Terrific Tuesday Giveaway - Welcome Kimberly's Fabric Stash!!!! 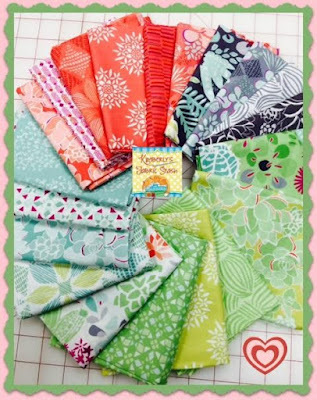 Today's Terrific Tuesday Giveaway is being sponsored by Kimberly's Fabric Stash, a brand new sponsor here at Happy Quilting!!! I asked Kimberly to send me a little intro to her shop so I could share it with all of you ;) So here's all about Kimberly's Fabric Stash . . .
Kimberly’s Fabric Stash located north of Pittsburgh, Pa opened in 2010 to serve a community of quilters and crafty people that wanted a more personalized experience. We encourage our customers to lead us in our products and services, so they can reach higher levels of satisfaction in their quilting and sewing. Fabulous fabrics fill our shelves which supports our customers overall experience. Our Kimberly’s Club offers the unique opportunity for them to decide what fabrics we carry, along with other great monthly benefits. It’s not the products that make our shop successful, it's our focus on our customer’s successes that has helped us grow and support them for over 5 years. So pop on over and see all about Kimberly's Fabric Stash!!! 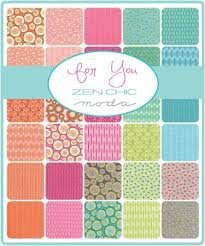 They carry lots of different fabric manufactures and have yardage as well as all the pre-cuts we love to stash!!! They also carry all of the threads, notions, and patterns to go along with all of that yummy fabric!!! And of course, you can't miss the awesome Sale Section for even bigger discounts!!! And before we get to the giveaway . . . Kimberly has something special to share!!! Use the coupon code HAPPY20 for 20% off your entire order this week!!!! Yippee, everyone can be a winner now with lots of fun shopping!!! And now that we know a bit more about Kimberly's Fabric Stash . . . Let's have the Giveaway!!! 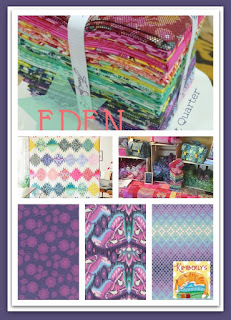 Kimberly's Fabric Stash has a beautiful custom Canyon Bundle by Kate Spain for Moda Fabrics. That is 20 gorgeous fat quarters of quilting goodness for one lucky reader!!!! ENTRY 2 - Let's welcome Kimberly's Fabric Stash with lots of Love!!!! You can Sign Up for their Newsletter (which will get your more coupon codes :) You can follow them on Facebook, Twitter, Pinterest, or You Tube. Or you can visit The Shop and then share a favorite item ;) Just be sure to leave a comment of how you showed your Kimberly Fabric Stash Love!!! Good Luck, Welcome to Kimberly's Fabric Stash and Have a Happy Quilting Day!!! My favorite fabric in my stash? Too hard to tell...I'll just say the fabric I'm working with now to make a Christmas quilt. I love everything purple in my stash! It is so bright and cheery! I love prairie at Kimberly's Fabric Stash! I bought a 1/2 yard bundle of pearl bracelet fabrics last year and just can't bring myself to cut into them!! I tend not to buy collections or designers - I just buy what appeals to me. So I don't have 1 particular fabric. I would have to say my scraps are my favorite part of my stash. Which is good since they keep growing!! Right now my favorite fabric is one that has pink elephants on an orange background. It is an unusual combination and the whimsical elephants are so cute. I love the Canyon range. For my stash it's so hard to choose my favourite. Probably whatever I'm currently working on! The Good Neighbors collection by Amanda Jean Nyberg is my current favorite. I just spent some time on the website and love it! I really like that it's easy to look at on my phone and the prices are great! 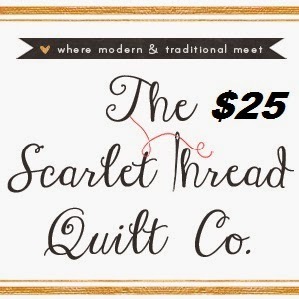 I think I know where I'm going to be spending my birthday money - I've got my eye on some Tula Pink and a Little Red Riding Hood layer cake. I love my Diamond Textiles. I signed up for the newsletter! What a great resource! Right now I love my reproduction fabrics! My favorites in my stash are my nautical prints, especially the ones with anchors. Oh and I love the Moda Dot Dot Dash jelly roll. Would go really well with my tie dye. Right now I am trying to use up some of my "stash" so I guess it is all my favorite. Would welcome this collection to join the rest that seems to be growing on the shelves. Must be fluffing and refolding it too much! I have a Color Me M bundle from the Intrepid thread featuring Maureen Cracknell's first fabric line that I just can't wait to cut into. Unfortunately, I have to wait. I do have a project lined up for it though! I signed up for the newsletter, also. Oh I love those Kate Spain ones! Im really loving my Michael Miller solids right now. My favorites are always the batiks. I love the way they read as solids but add subtle texture while showcasing the quilting. My stash favorites are still my civil war prints...they just make the most comforting cozy quilts. I have several Joel Dewberry fabrics in my stash that I slather over and hate to cut into unless I know it's a perfect fit for my project. What a great collection of fabric! My Heather Bailey fabric is my favorite in my little stash right now. One of my favorite items from Kimberly's shop is Dot Dot Dash by Me and My Sister...would love it in a jelly roll! My favorite is Feed Company. So nice for little boys! I'm currently drawn to browns... maybe it's my love of chocolate! I go distracted by her great blog- but I sure do like Windemere! I signed up for KFS newsletter. Good site! my favourite fabrics in my stash are my collection of denyse schmidt prints. i don't know if i'll ever use them. i love to look at them and pet them. hahahaha! cozy cotton flannel with little animals - perfect for baby items! I am currently enamored with the look of a neutrals quilt, black, grey, tan, brown so I have been hunting those up from my stash and then there will be some necessary, yes necessary, additional purchases. I signed up for Kimberly's newsletter. It looks like she might even have daily deals sometimes! I love the Dutch chintz that I got in Amsterdam. My favorite stash is April Showers. I signed up for their newsletter, wishThis shop was closer to me,, sigh. Lovely line of fabric! My favorite fabric stash are fabrics with multiple colors ...they can be used with SO many projects. 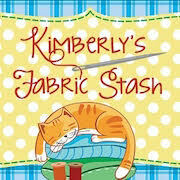 I now follow Kimberly's Fabric Stash on Facebook. I signed up for the newsletter at Kimberly's Fabric Stash. I love the lulabelle fabric on her site. My favorite fabric in my stash is my American Made Brand solids - they go with everything! My favorite in my stash is a pink with unicorns print from Heather Ross far far away collection. I'm hording it. My fabric fabric in my stash is my fat qtr collection of Downton Abby inspired prints - it's so gorgeous I can't bear to cut it yet!! Believe it or not I recently lost my stash in a move :( I would love to win to start over!!! I have been collecting Allison Glass's fabrics for some time now - some day I will cut into them, meanwhile I just look. I just bought Gooseberry and am excited to make it into a quilt. Almost too many to mention, let's say classics like kaffe & Amy Butler for starts! Bonnie and Camille fabric always finds a home in my stash. Thanks! Too hard to pick a favorite! I am going to follow Kimberly' Fabric Stash for sure. Love those colors in the Canyon Bundle. Following Kimberly's Fabric Stash on FB. Right now my favorite fabric is a medallion print from Madhuri - I am loving Indian designs lately. Thanks for the fun giveaway! I signed up for Kimberly's Fabric Stash newsletter. Thanks! I have some Summer Breeze in my stash waiting for the right pattern! I love my new blueberry park bright jelly roll! Kim has some great color specific Canyon bundles! My new purchase Sommer by Sarah Jane! Favorite in my stash.....all the really dark purples and lime green. My favorite fabric is a piece of April Showers the navy with the small flowers print. I don't know what I'll use it for, but I love it! My favorite is anything green!!! And turquoise. And red. Don't forget yellow. I'm hopeless. Am now adding Kimberleys shop to my daily blog check!! I am following Kim on Facebook, Twitter and Pintrest. I love to Pin! Plus I picked up a half yard on her site of those cute ladybugs on sale. my stash favorite is eclectic elements by tim holtz. I love love love blue! I have some new jelly rolls in various blues with a few greens and purples thrown in that will be exciting to use. I signed up for Kimberly's newsletter and followed on Pinterest and Twitter. Love my Kona solids, all of them! Thanks for the give away. i follow kimberly on pintrest. I have only favourites in my stash because I only buy what I love, and then I love it so much that I can't bear cutting it... LOL. I'm rather into solids at the moment. Thakns for the chance! I follow Kimberly's FB page. My favorite fabric in my stash.....hard to say but Amy Butler usually wins. I have some yardage of a free spirit (I think) patterned print for a quilt back. Its so soft. Picking a favorite in my stash is like trying to pick a favorite child, I love them all. Anything blue really gets preferential treatment though. Terrain by Kate Spain is my favorite stashed fabric. Signed up to receive Kimberly newsletter. In my stash I have some of the Heather Ross linen blend. I love it and I am scared to cut into it . .
My favorite thing in Kimberly's shop is Alice's scrapbag, and she still has a bit of it! I am a huge Kate Spain fan, and her fabrics are definitely among my favorites... and I don't have any Canyon yet! Signed up for the newsletter, looks like a nice shop. Thanks. Right now I am loving my Kona Solids preferably teal. I am liking Alice's scrap bag at Kimberly's Fabric Stash. 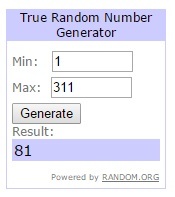 Thank you for the amazing giveaway. I do stash. My current go to picks are interesting grey prints or low volume prints. This updates my collection. Currently it's my 30's collections. My favorite fabric is the new Studio 8 by Quilting Treasures. I picked up several pieces on a quick trip to Syracuse Ny ( Marcellus, actually!) and all I know is that it's staying at my house! I signed up for the Newsletter at Kimberly's Fabric Stash. I'll be sure to visit them next time we venture to a Pirates Game. My favorite fabric in my stash is a panel that I just can't seem to cut into! My favorite fabric is my batiks right now. making a star quilt with them! My favorite fabric is a tiny piece I have gradually all used up. It is old (at least 20 or 30 years old) and nothing special (or so I thought), but it works, it's nice quality and just versatile. A smaller, floral print that is just very nicely printed. Wish I had more. My current favorite fabric is a package of Tonga Treats. I am dreaming about what I will do with them. I'm loving my Fusions Confetti. Thanks for the giveaway. I signed up to for the newsletter. I love my vintage Tula Pink. FAvorite fabric in my stash....has to be my christmas collection....a little bit of everything Christmas. At present, my favorite fabric stash is Bari J's Emma Grace bc I am making something with it and the fabric is just so beautiful. I see some new stuff out there that is catching my heart though.... Congratulations to Jennyroo, she will love her prize!! I signed up for Kimberly's newsletter and looking forward to getting that. Love to have red prints in my stash and use them as pops of color. I can't help but stash away Fig Tree and Com. fabrics... any of them! 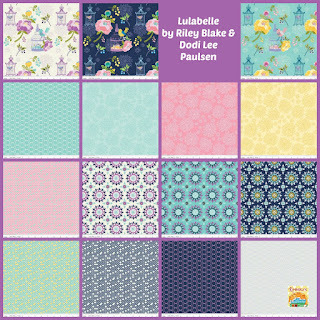 I love Mistletoe Lane and have three jellyrolls to make quilts fir next Christmas. New shops are always fun to visit. Welcome Kimberly to my stash of shops. I signed up for Kimberly's Newsletter! Looks like such pretty fabric in her shop! My favorite fabric in my stash would be the Bonnie and Camille shelves. That stuff makes me so happy! Pick a favorite? You're joking right? I have lots of Zen Chic prints I love, some Kate Spain Central Park that's too precious to cut, some of the Metro Cafe print with the toasters, and on and on. I get way too excited about fabric. Love the shop and the wonderful sale section! One beauty I saw is Hummingbird Flower Fabric Meadow Birds Fabric Blue. Mmmmm....... This bundle is gorgeous! Right now I'm also loving First Crush, ❤️ It is February!!! Love my Joel Dewberry bundle but The Canyon bundle could very easily become my favourite. It's a tough one, but I absolutely love my Robert Kaufman Grinch fabric! I have a couple of bundles that are destined for festive projects in 2016! I have some great vintage feedback prints!! Dreamin Vintage from Jeni Baker & all my Tula Pink's. My favorite fabric in my stash is the one I am currently using - ha ha - currently it is Summer Breeze III. I am following Kimberly on u-tube and have signed up for newsletter. I checked out the website and signed up for the newsletter. Now I follow Kimberly on facebook. I found a big stash of roses fabric that I want to make a quilt with. Gosh I donto know what my favorite is I love so many different fabrics. Probably have to say a mini rose vintage print I found yardage of that matched a pillow case my Mother made 40 + years ago! Current fabrics would be almost all florals! LOL! My favorite fabric in my stash would be Heather Ross Fish in Bags. I follow Kimberly's Quilting via FB. I have some neat fabrics from a friend from singapore. My favorite piece of fabric in my stash is a piece of multi-colored butterflies on a black background. I am planning on making a quilted purse with this fabric. My favorite fabric in my stash is som original Katie Jump Rope! My favorite fabric in my stash is a generic fat quarter I got a few years ago. It's a beautiful blue scroll motif on a black background. Thanks for the chance to win! I like/follow Kimberly's Fabric Stash on FB! My favourite fabric is highly variable but at this moment amounts to Carolyn Friedlander combined with coordinating solids. Swoon! My favorite is a great red and white dot. I signed up for Kimberly's newsletter. Loved looking through her shop, Tula Pink! Be still my heart! Lol. Thanks again! Mercy, Melissa, my favorite fabric???? I love my entire stash!! I can't pick a favorite!! I love the Naptime Bundle at Kimberly's Fabric Stash. Hmmmm... I have some treasured Liberty of London fabric in blues, it's just so beautiful but I haven't found the perfect quilt pattern for it yet!! I signed up for Kimberly's newsletter. Always fun to see what another site carries. I have signed up for their newsletter and following via FB!! Thanks for the chance to win Kate Spain's fabric collection Canyon... I just love everything that she designs, my favourite fabric designer too! My favorite piece of fabric in my stash is a pansy print; purple and yellow flowers. I haven't been able to bring myself to cut it up yet. It must be about 10 years old. I have a beautiful pink rose fabric. I need the right project for it.